Your definition of small springs may vary, depending on what you’re accustomed to. However, whatever your particular definition may be, Airedale Springs offer a flexible service to supply you with the precise coil spring or custom wire form that you need. With no set industry specification for a “small spring”, it is essentially a relative term; if you’re used to working with heavy gauge springs with an 18mm wire diameter, then anything smaller will be a small spring to you, whereas if your normal stock is made from 4mm diameter wire, that would be your base line. At Airedale Springs, our coiling wire range covers a wire diameter of between 0.15mm and 10mm, meaning that we can cater to a wide range of specifications, and for a wide range of applications. Whether you’re looking for compression springs, torsion springs, or any other type of spring, our technical team can apply their many years of experience to help you get the most appropriate coil spring or wire form for your needs. Furthermore, our custom service means that we can give design assistance and create a spring that meets your needs. 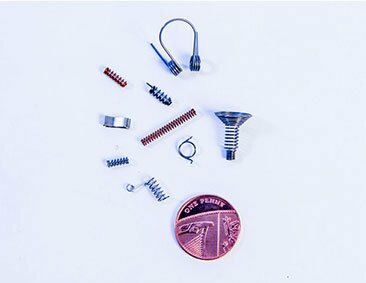 We offer advice on materials, finishes, and particular restrictions concerning smaller spring sizes – for example, if you would usually have the ends of your compression springs ground flat, this is not recommended when the wire diameter is below 0.5mm. Airedale Springs is a family business with a strong reputation for up to the minute expertise and unparalleled customer service. We combine traditional skills with cutting-edge manufacturing capabilities to give you the best quality products, whether you need a one-off custom order or a bulk spring order. Whatever your definition may be when you think of small springs, we can help. For more information, or to discuss your requirements, all you have to do is contact us on 01535 643456, and speak to one of our friendly team of experts.